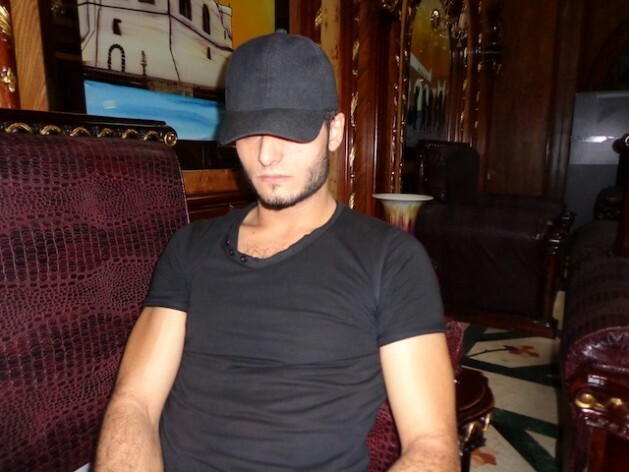 Ridwan, a former rebel fighter from Tripoli. Credit: Mel Frykberg/IPS. TRIPOLI, Sep 2 2012 (IPS) - In the aftermath of Libya’s revolution, Libyan fighters and weapons are flooding areas of conflict in neighbouring countries, according to local fighters and officials in several countries. Libya’s still heavily armed militias continue to sell their weapons on the black market directly to foreign militias from war-ridden countries, or to arms-dealers from third countries who then sell them on to warring factions, they say. “All of the militias are involved in selling weapons. There is no law in Libya, still no functioning government, and the country’s security forces are too weak to control the situation, so selling weapons is regarded as legal by many of the rebels,” said Ridwan, a former rebel who fought with Tripoli’s Suq Al Jumma Katiba (brigades). “Many of the fighters got greedy following the war and believe they are entitled to compensation for the sacrifices they made for their country as they believe the government has abandoned them,” Ridwan, who did not give his last name, told IPS. Libyan Islamist fighters are also reported to have swollen the ranks of the Free Syrian Army (FSA) in their fight against Syrian President Bashar Al Assad’s security forces. The presence of Islamic extremists in North Africa’s greater Sahel region, bordered by Algeria, Burkina Faso, Mauritania and Niger, has contributed to destabilising the area. Tuareg rebels have declared their own state, Azawad, in the northern part of Mali, which has also been invaded by Ansar Dine, an Islamist group that works closely with an organisation known as Al-Qaeda in the Islamic Maghreb (AQIM). The Tuareg are an indegenous people in the Saharan region. As fighting rages on in Mali, reportedly supplemented by Libyan weapons, a number of foreigners have been kidnapped. Dr David Zounmenou from the African Conflict Prevention Programme at The Institute for Security Studies in Pretoria, South Africa, concurred with Diakite. “The Sahel region is awash with weapons and those returned Mali gunmen. Many of them Tuaregs who fought with Gaddafi now have no benefactor. In addition to being broke, they also feel marginalised and politically disaffected,” Zounmenou told IPS. Nigeria’s Boko Haram Islamist militants, who are battling the government and Christians, have set up an alliance with AQIM. Weapons looted from Libya have turned up in Nigeria according to Nigeria’s defence minister, Olusola Obada. Mokhtar Belmokhtar, a key AQIM leader, who operates in the southern Sahara and the Sahel belt, was recently seen in Libya buying arms. Ridwan told IPS that it wasn’t only AQIM who had travelled to Libya on an arms-buying spree but Syrian middlemen were also visiting the country to buy arms en masse. According to a Syrian friend of Ridwan, Syrian civilians are also receiving military training from former Libyan rebels. The latest market for Libya’s weapons appears to be Egypt’s Sinai peninsua where Egyptian security forces continue to clash with Islamists after a deadly attack last month that left 16 Egyptian soldiers dead. According to media reports the weapons include Soviet-supplied SA-24 surface-to-air missiles. Ibrahim Al-Monaei, who has previously been arrested for smuggling weapons from Egypt to Gaza, told Al Arabiyah TV that all the weapons entering the Sinai Peninsula now are from Libya. Meanwhile, Jihadists in Syria are being supported by possibly hundreds of former Libyan rebels, many of them from Gharyan, 80km south of Tripoli. The men from Gharyan reportedly joined the ranks of the FSA after the city’s mufti Sheikh Sadik Gharyan called on Libyans to stand by their brothers in Syria. Islamist Abdul Basset Abu Arghob, an oil engineer by profession, who commanded the Gharyan Brigades during the revolution, said he had considered going to fight in Syria. “I decided against it in the end as there is so much work to be done in Libya. But many of my comrades have gone to fight in Syria as we believe the war there is part of a holy Jihad against bad regimes in the region and it is our duty as Muslims to help our brethren,” Abu Arghob told IPS. One of the most prominent Libyan fighters in Syria is Mahdi Al Harati who used to command the Tripoli Revolutionary Brigades, one of the first Libyan brigades to enter Syria in August last year. Al-Harati said that victory in Libya and the support of world organisations for Libya encouraged him to pass his experiences on for the benefit of Syrians. “After many Syrians approached me asking for my help, I felt it was time to do more and due to the great success of the Tripoli Brigades we felt it was time to act,” said Al-Harati.